The season-opening 6 Hours of Sebring may have left more questions than answers in NEO’s deep GT class after CoRe SimRacing drove its Ford GT from the mid-pack to victory lane. What about the Porsche stranglehold on the class? How did the top-qualifying teams let the race slip away? At least it seemed like series veterans had the advantage. However, entering one track where experience is key to avoiding incidents and negotiating traffic, even that storyline was upended by an upstart team making an early impression on the series. The pre-race qualifying session saw another nailbiter in the class, with 1.5 seconds covering 19 out of the 20 starters. 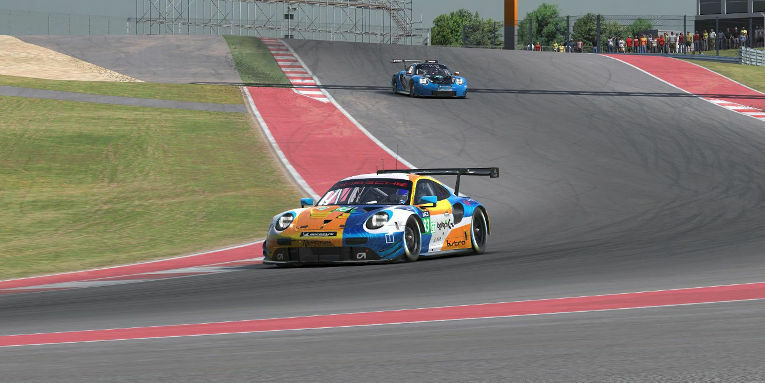 On pole was Kamil Franczak making his season debut for TRITON Racing, and Yannick Lapchin joined him on the front row in the Logitech G Altus Esports Porsche 911 RSR. The GT field tackles turn 1 on the first lap. While Porsches managed a front-row lockout, it was far from a dominant showing by the mark that makes up more than half of the GT field. Thrustmaster Mivano Racing qualified their Ford GT in third, Redface Racing started sixth in their Ferrari 488 GTE, and the Sebring winners from CoRe SimRacing gridded their Ford in seventh. After a start that saw two- and three-wide racing through turn 1 — including a pass for second place by Mivano — the opening laps of the race became a calm before the storm. 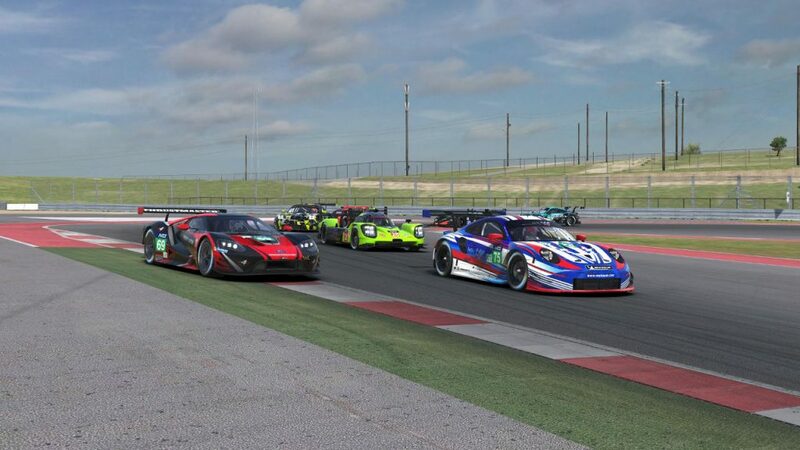 The GT drivers knew the impending approach of lapping prototypes could upend their races, so the field largely stayed single file in the first few trips around Circuit of the Americas. 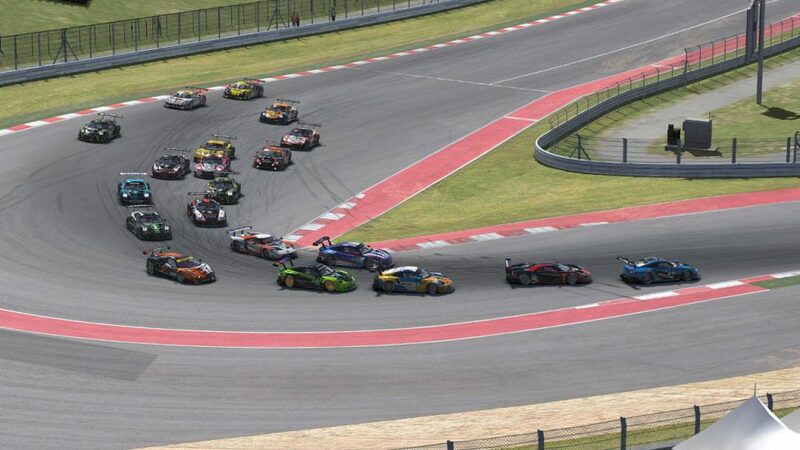 Once traffic arrived, the first big incident in the GT field unfolded. A side-by-side battle entering the esses between the Army Racing Team and Odox Motorsport left Odox spinning, and as the field checked up behind, the SRN Motorsports Ferrari was spun by a fast-approaching prototype. Army was called to the penalty box for that incident and another within the first two hours, ending their hopes of repeating the fourth-place finish from their Sebring debut. Odox spins through the esses after contact with the Army Racing Team Porsche. Indeed, it was GT cars — not prototypes — at fault for several of the issues early in the race. Later in the first stint, Odox plowed into the F4H Motorsport P1 car in turn 11 and Team Eighty-Five also served a pair of penalties for incidents with P2 cars. Their teammates in the Team Eighty-Four entry didn’t fare much better, although they were on the receiving end of a prototype punt in the esses that ultimately sent them to the pits for extended repairs. While the mid-field was chaotic, the frontrunners were close but controlled. Heading into the first round of pit stops, TRITON led Mivano and Altus by just two seconds. Those cars stuck with a more traditional pit strategy, pitting at or just after the hour mark, but not all GT teams were on the same game plan. ZENNITH eSport, Euphoria Drivex Racing, and Redface Racing all drove to the end of their fuel tanks, hoping that surviving a few extra laps on worn tires each stint could pay dividends later in the race. SimRC battles with Euphoria Drivex Racing. The second round of stops brought a surprising change of second place. While Mivano had distanced itself from Altus by nearly five seconds, a quicker pit stop and faster outlaps allowed Lapchin to leapfrog the Ford and set his sights on TRITON, then with Dawid Nowakowski behind the wheel. By the end of that stint, Altus made it to TRITON’s rear bumper but couldn’t complete the pass. That would become Aussie driver Andrew Kahl’s task as he took over just before the midway point. Behind them, Mivano’s backwards slide continued, with former NEO COTA winner Fabio Gonzalez relinquishing the third position to MSI eSports’ Alejandro Sánchez on lap 78. Between the varying strategies, driver changes, and some bad luck in traffic, there was plenty of other movement inside the top ten during the middle stints. 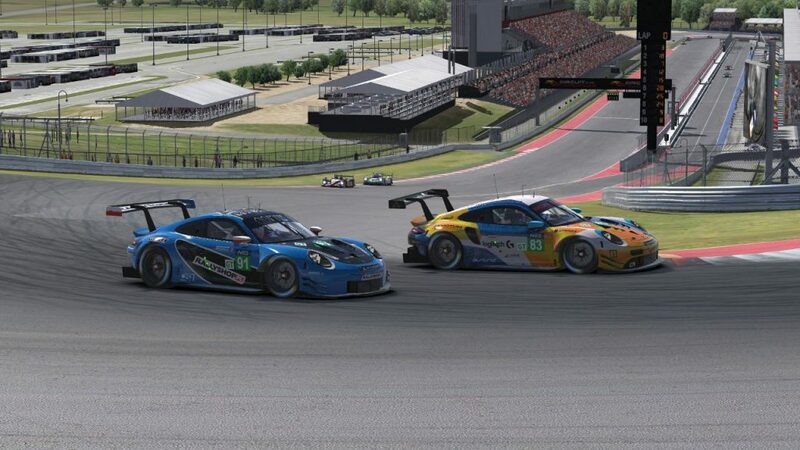 SimRC.de moved from fourteenth at the start into fifth place by the three-hour mark, and Redface’s fresher tires allowed Laurent Miskiewicz to drive from eleventh up to sixth. Two other teams were going the wrong direction. Torque Freak Racing’s Tim Claessens was spun by a prototype in turn 7, costing him two positions, and Torrent Motorsports’ Jordan Weekes toppled one of the tricky pyramid kerbs in the esses to send his Porsche spinning. Mivano runs wide, allowing MSI eSports to pass for third place. Just past halfway, the top four cars had separated themselves from the rest of the field, but the gaps behind them remained close enough that a single mistake could have made the difference between contending for a top five and falling out of the top ten. SimRC learned that the hard way. 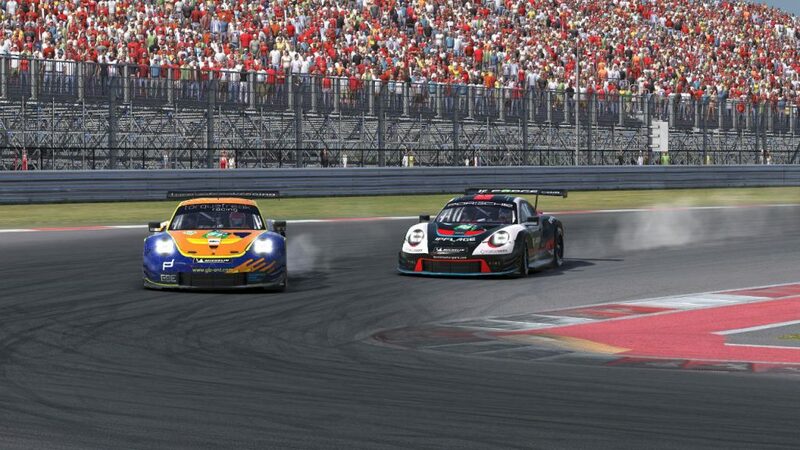 A spin at the hands of the Torque Freak P2 car with two hours remaining dropped them from fifth to eighth, and contact with the second-place P1 car of Sorg eSports sent them into the penalty box and down to tenth. CoRe also found themselves dropping down the order after a pair of incidents that damaged their Ford GT. Early in the race, they took to the grass to avoid a passing prototype and warped the floor of their car. Later contact from an HPD also hindered their top speed and kept them out of the top ten. While they had a stranglehold on the race lead in the final two hours at Sebring, the top spot was far from decided in the late stages at COTA. In the second-to-last round of pit stops, Altus pitted one lap after TRITON and Kahl entered turn 1 with a nose ahead of Franczak to take the position. Altus’ Andrew Kahl takes the lead after exiting the pits. With air and track temperatures falling, Kahl set his fastest lap of the race in the final 15 minutes. 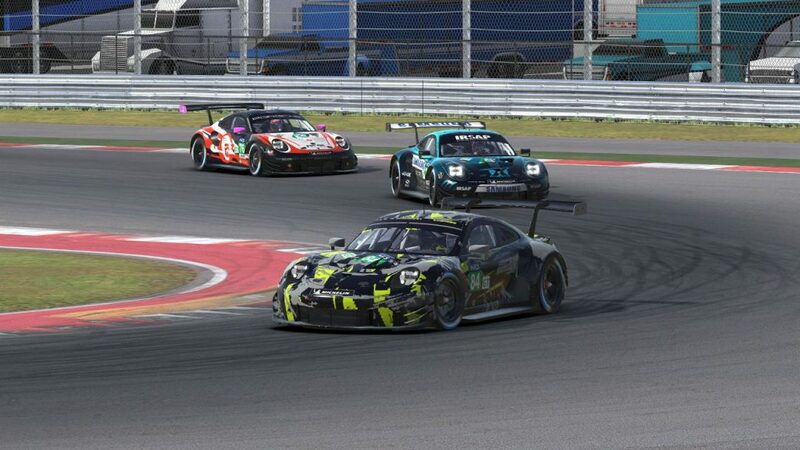 Although Franczak cut the gap to just two seconds, Kahl and Altus managed to hold on and score their first NEO Endurance Series victory. MSI drove a clean race and scored their first NEO podium, staving off a late surge by Mivano’s Anders Dahl, who set the fastest lap in the GT class. ZENNITH eSport was fifth, leading home the cars who attempted to stretch their tires and fuel tanks to the limit. Redface Racing was sixth and Euphoria Drivex Racing finished seventh. Torque Freak, Torrent, and SimRC all rebounded from their earlier issues to round out the top ten. It wasn’t without a fight, though, as Torque Freak’s Antti Salminen and Torrent’s Kevin Siggy waged an entertaining battle to the finish. Torque Freak and Torrent lock their brakes entering turn 12 on the final lap. 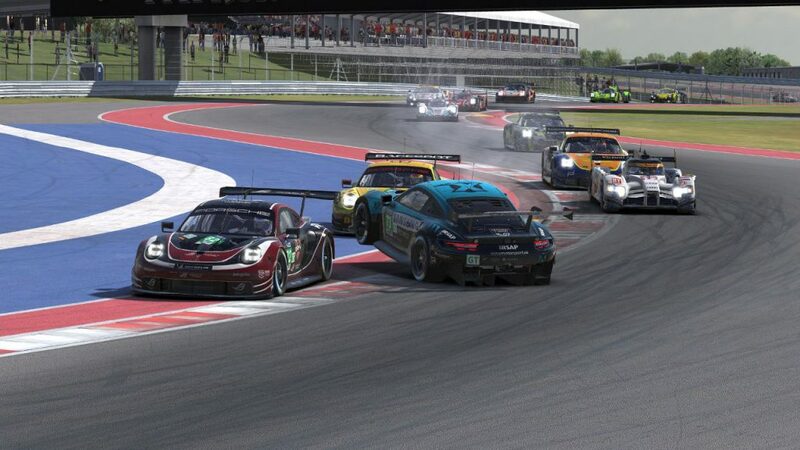 SimatoK eSport hovered on the edge of the top ten all race but ended up in eleventh. 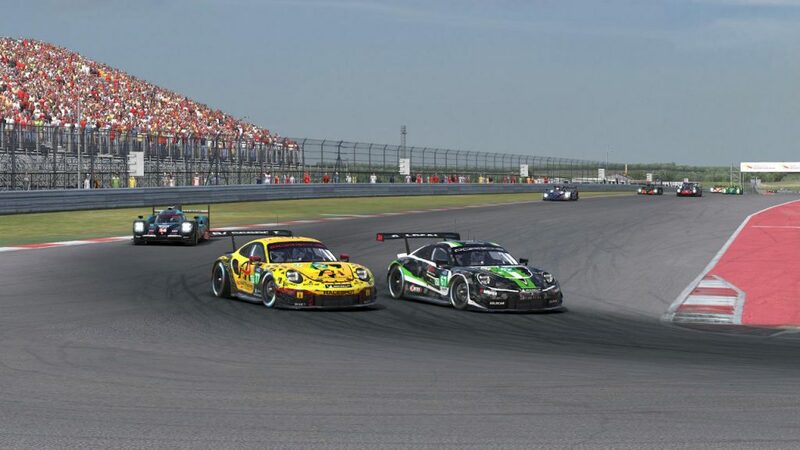 CoRe limped their damaged Ford home in twelfth and the Porsche Basel by Sorg Rennsport eSports GT Porsche came home thirteenth. After narrowly missing a points-scoring finish in Sebring, Team Buschfink Racing claimed a pair of points at COTA with a fourteenth-place result. Two early two penalties knocked Sebring polesitter Team Eighty-Five down the order to fifteenth, where they picked up the last available point in class. It was a rough weekend for Williams JIM Esports. Their star-studded #96 car didn’t make the virtual trip to COTA and their #97 team struggled for pace, qualifying last and finishing in sixteenth. The cars behind them all suffered problems during the race. The once-penalized, twice-damaged Odox Motorsport team was seventeenth. Their early opponent in the esses, Army Racing Team, finished a disappointing eighteenth. After taking collateral damage from that incident, SRN Motorsports was nineteenth, and Team Eighty-Four finished twentieth. Team Eighty-Four leads Odox Motorsport and Team Buschfink Racing early in the race. Through two races, NEO’s GT class has in many ways defied expectations. After all, you’re not supposed to pass 11 cars in two hours at Sebring, or take a four-month-old team to victory lane at COTA. While the two prototype classes have each found a clear frontrunner, that’s far from the case in the GT ranks. TRITON Racing’s pair of second-place finishes has given them the points lead, but any of the top six teams in the standings seem like a legitimate threat to take the title. Perhaps that’s no surprise at all. Given that it’s the most competitive class in series history, you would expect it to keep you guessing all season long.